Authors – K. M. P.
Topo A.K.A Scott Matz is an artist, musician, and special education teacher. He has played in many bands including Old Hickory, Martian Lamps, Happy Ending, Hello Menno, Dream Apes and most recently Sorry About Everything. 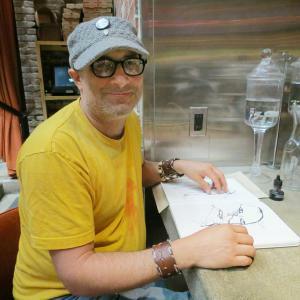 Topo coined and actively engages in what he calls DUI: Drawing Under the Influence and has traversed Los Angeles bars and pubs in search of counter tops on which he creates his drawings. In June of 2014 Topo’s drawings were featured in the inaugural event of the Mohawk Bend series Artists Worth Celebrating which was featured on CBS Los Angeles blog Best of LA. Topo donated all the proceeds from the event to Villa Esperanza in Pasadena. 100 Limericks will be Topo’s first publication of his drawings. Visit Topo’s Instagram.